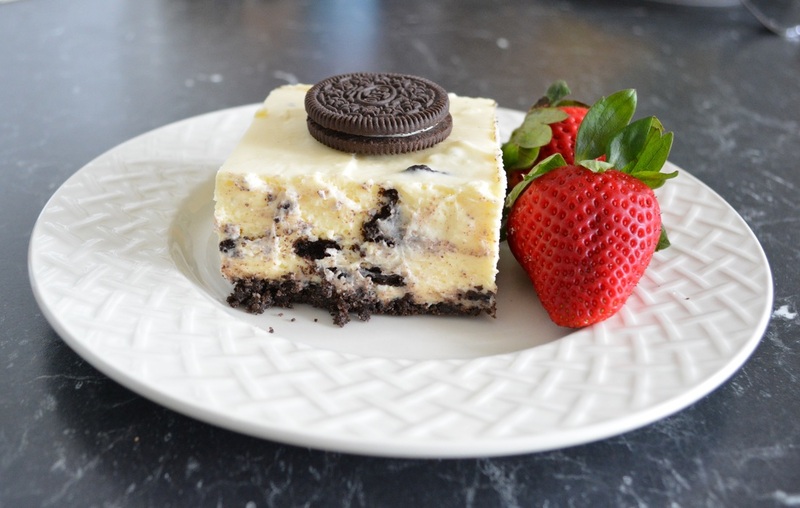 I have tried many a cookies and cream cheesecakes in the past and most have been too sweet for my liking, there was just something about them I didn't like, so I would move on to the next recipe and the next recipe until now. Finally I have found one that although is decadent and rich, it's just not over the top sweet like the others I have tried. This one is creamy, it is light, it is tasty. I'm pretty sure I won't be looking to find anymore cookies and cream cheesecake recipes, this is it, this one I am happy with. Now I have modified this recipe from the original recipe I found, I reduced the amount of butter in the base, I reduced the amount of white chocolate, I reduced the amount of gelatine and I have made it in a larger pan than the one suggested in the original recipe. Now I reduced the amount of butter in the base as it was just too greasy, you just need enough butter to hold everything together. I reduced the white chocolate as originally I found it too rich. I reduced the amount of gelatine as I just thought it didn't need as much, and I was right. And although I love it as is, next time I make it, I will reduce the gelatine again, just to see what happens, if it sets and works with less gelatine, I'll let you know. Now for the pan size, when I first made this the suggested pan size was 20x 30cm. I had one that was a slice tin in that size and well there was no way the mixture was going to fit into this pan size, so luckily I had a few extra Oreos that I blitzed up and made a small round (19cm) cheesecake with the extra Oreos and the leftover cream cheese mixture that couldn't fit in the pan. So now I use a larger pan, and it fits perfectly. Even if I had a 20cm x 30cm baking tin with higher sides, the cheesecake would have been too high anyway, so that size tin was never going to work for me. You could also easily make this in a 23cm or 25cm round springform tin and serve it as a round cheesecake, but as the cheesecake is rich, I find small squares better for me. When adding the gelatine, make sure you pour it into a warm jug before you add it to the cheese mixture, it will help with the pouring with the mixer on, I tend to make a mess if I try pouring it straight from the bowl. And if you have a splatter guard with your mixer, use it when adding the gelatine, it splatters a little and cleaning up gelatine is not that much fun. And if you do make a mess, just let it set on the bench, once set it is easier to clean than when wet. But don't let this deter you from making the cheesecake, I'm just giving you a heads up on things I did wrong to stop you from doing the same. You can make this with a hand held mixer, it is just easier with a freestanding one. Below I state it makes 20-30 slices. I like the slices smaller for parties, so I get at least 30 slices out of it, but you can serve them larger as a dessert and you will get 20 slices out of it. So that is up to you, how you will serve it up. So here it is, my favourite cookies and cream cheesecake, hope you love it as much as I do. Line a 22cm x 32cm (base measurement) baking tin with baking paper, make sure all sides overhang a little, (especially if using a slice tin as the cheesecake goes up the sides just past the rim of the tin, the baking paper will keep the cream cheese in place). Place 250g of the Oreo biscuits into a food processor and process to fine crumbs. Add the melted butter and mix to combine. Press the biscuit crumbs into your prepared tin, you will just have enough crumbs for this sized tin, so spread it out evenly. Refrigerate while you make the filling. Place the gelatine in a bowl with 1/2 cup water. Place the bowl over a small pan of simmering water, stirring occasionally, until the gelatine has dissolved, remove from heat, cool slightly. Place the cream cheese, sugar and vanilla extract in the large bowl of your freestanding mixer using the paddle attachment. Beat until smooth, scrape the bowl at least once to make sure it is all mixed well. Pour in the cream, and continue beating until smooth and combined. Again, scrape down the sides and base of your bowl to ensure it is mixed well. On the lowest speed, slowly drizzle in the gelatine mixture, then add in the melted white chocolate. Using your hands, chop up the remaining 150g Oreos and stir through the cream cheese mixture. Carefully pour over your prepared base, smooth the surface and place in the refrigerator to set for an hour. After an hour, you can cover with cling film as the top would have set, then leave in the refrigerator for at least 4 hours to set properly.